Lactation Support Group for Black Breastfeeding Week with boober. 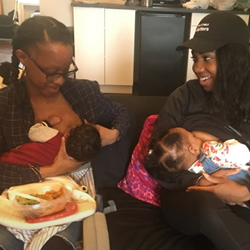 “boober is passionate about supporting new parents in their feeding journeys and we recognize Black Breastfeeding Week as an essential means to draw attention to the unacceptable racial disparities in our healthcare system,” says Jada Shapiro, founder of boober and Birth Day Presence. Parents with babies of all ages are welcome to attend. The gathering will take place up one flight of stairs, so babywearing is recommended. (Parents who bring strollers should plan on folding them and bringing them upstairs into the studio.) Participants will have one-on-one time to address individual needs, as well as opportunities to meet and socialize with others. boober is the world's first on-demand service that quickly connects new parents to expert, in-person lactation support. boober was created by the founder of Birth Day Presence, New York's most trusted source for doulas and childbirth education, to take the pain and stress out of breastfeeding and the first days of parenting a newborn. Parents can simply text 347-688-5070 or go to getboober.com and boober will connect them with a vetted lactation professional for an in-person, same-day visit at their home or hospital. For additional information, please visit getboober.com.